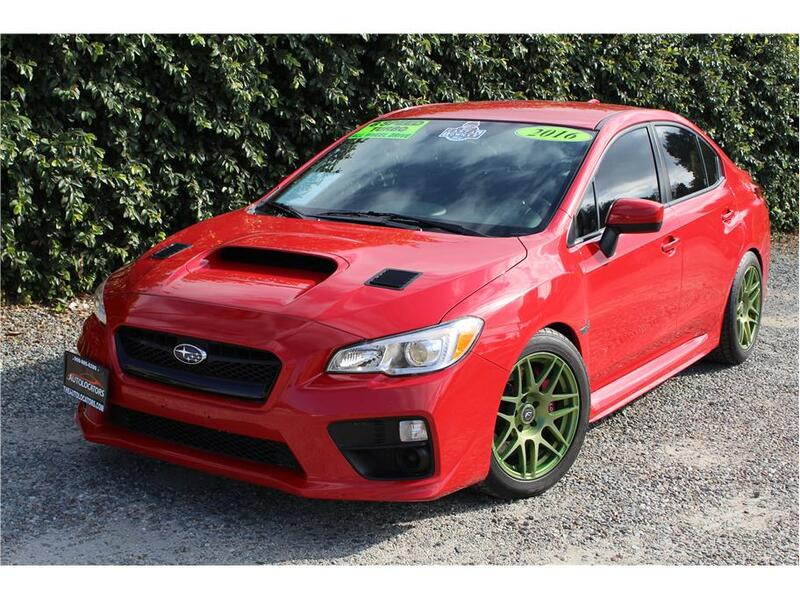 Home > > Vehicles > 25737 > 2016 Subaru WRX WRX SOLD!!! This speedy All-Wheel Drive 2016 Subaru WRX Sedan has the Turbo 2.0L 4cyl motor with a 6 speed manual transmission and only 25k miles! Over $8k in aftermarket goodies! Aside from great looks, this WRX delivers performance to compliment the looks with great add on features like a CSF all aluminum radiator, Grimspeed radiator hoses, Yellow Speed Racing big brake kit on all four corners along with drilled and slotted rotors, Odyssey battery, Velox rear billet adjustable arms, Superpro front arms, Forgestar F14 wheels wrapped in 255/45/17 Nitto NT555 Extreme ZR and sitting low on adjustable Fortune 500 series coil-overs on all four corners! Great factory features such a 6.2 inch Infotainment system offering Bluetooth capability, radio, steering wheels controls, Informative Multi-function LCD panel displaying turbo boost pressure, engine vaccum and peak boost value readouts. Our Subaru just went through a complete 151 point inspection by a licensed repair shop and received a new cabin air filter and oil change service. This WRX is in great condition and is ready for its next owner. Come by and test drive it today! Auto Locators is a family owned dealership that was established in Southern California for over 16 years. We are also a California Licensed repair shop and all of our vehicles receive a 151 point complete and comprehensive inspection by our licensed mechanics. When you buy a vehicle from us we welcome you to our family. Call 909-810-1143 or Text 909-939-9434 or come by today, you can also view our entire inventory on our website at www.theautolocators.com.